This Slow Cooker Sweet Potato and Cauliflower Soup is positively delicious and so easy to make. 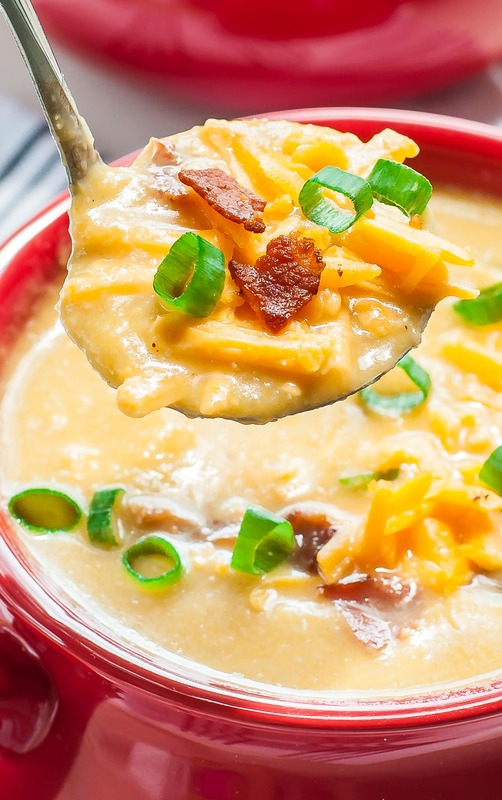 Get ready for creamy cauliflower soup like you’ve never had it before! I’m mostly settled in the new house and gearing up for Fall by stocking our freezer with all kinds of deliciously sketch-free “fast foods” for a chilly day. I kicked off project FREEZE ALL THE THINGS!!! with a giant pot of my go-to tortilla soup and a second crock-pot filled with my new favorite food group, Sweet Potato and Cauliflower Soup! While it may not technically be it’s own food group, it should be! It’s easily one of the most delicious days to get your daily allotment of the most important food group there ever was, VEGGIES! Oh come on, you totally saw that coming. Much like the chickpea, my wild and crazy toddler who has recently been trading her afternoon nap for an epic dance party, this soup practically danced its way into my face. Cauliflower! Sweet Potatoes! Onion! I had a surplus of all three since I had sent Paul to the grocery store the day prior. Usually I do the grocery shopping [I’m one of those weirdos who LOVES grocery shopping!] but since I was on a roll with unpacking, I asked Paul to help stock the pantry and “buy whatever.” I half-expected to be greeted with a zillion bags of jalapeño potato chips and a few boxes of cookies for good measure. He once came home with 5 pounds of peanut M+Ms because he didn’t know he needed it until he saw it. To my delight, my knight in shining armor [or stud in a dirty flight suit] brought home four bags of fresh produce. Holy veggies, Batman! My hero! Though the real hero of this story is Katie for inspiring this recipe. 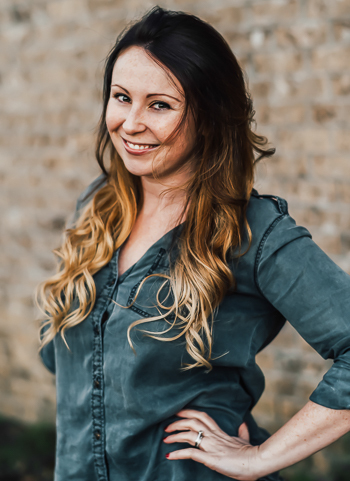 Totally check out her blog when you have a chance, she’s beyond awesome! This soup is so faceplantingly delicious, I can’t get enough! It was great the first day and even better the next! And the next! I tucked the remainder of the soup into the freezer for a rainy day, but already want to dive in after it. Needless to say, I’ll be making more super soon. This Slow Cooker Sweet Potato and Cauliflower Soup is positively delicious and so easy to make. hot sauce for even more kick! Set your 5 or 6 quart slow cooker to high and add cauliflower, sweet potato, veggie broth, onion, garlic, green onion, thyme, paprika, red pepper flakes, and salt. NOTE: If the broth you're using is on the saltier side, feel free to skip the salt and simply add it in later, to taste. Same goes for the red pepper flakes - if you want a super mild soup you can always sneak some in later. I added a teaspoon of RPF to mine and it gave the soup a delightful little zing. Cover and cook for 4-5 hours on high. Once the veggies are fabulously tender, turn off the crock-pot and add your milk and cream cheese. Blend using an immersion blender [my favorite space-saving appliance ever!] and you're good to go! Ladle soup into bowls and enjoy right away with a mountain of your favorite toppings, then store the remaining soup in your fridge or freezer. As written, the recipe will yield around 4 quarts of soup which equates to 16 eight-ounce cups or 8 hearty bowls. It tastes great the first day and even better the next! This soup will keep for 4-5 days in the refrigerator and freeze marvelously for 2-3 months! Simply store the soup sans-toppings and add all your goodies upon reheating. Easy peasy! Recipe yields about 4 quarts of soup which will usually equate to 16 cups or 8 bowls. Nutrition facts for one cup of soup below are an estimate provided by an online nutrition calculator. Add your favorite topping and adjust as needed. t-rex chefs: feel free to use chicken broth if you prefer and go nuts with the bacon – SWOON! brontosaurus chefs: skip the bacon topping entirely or grab some veggie-friendly bacon bits or tempeh bacon for a delish smoky crumble on top! I’ve had this soup every which way and think it’s absolutely marvelous however you top it! Paul likes the bacon/cheddar/chive combo best and I’m a sucker for a simple sprinkling of cheese and chopped green onion. You can even spice things up a bit by topping the soup with red pepper flakes or a drizzle of your favorite hot sauce; have fun with it! 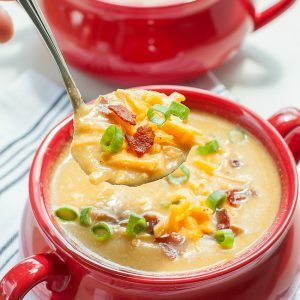 I hope your family loves this Slow Cooker Sweet Potato and Cauliflower Soup as much as mine does! Enjoy! Have a little extra time on your hands? (I’m jealous; come wash my dishes!) Feel free to amp up the flavors of this soup even further by oven roasting your veggies first. Simply give them a rough chop and drizzle with olive oil or butter and pop them on a lipped baking pan for 30 minutes or so at 400 degrees F. Set a timer and walk away. Preferably in the direction of my sink. I wasn’t kidding about those dishes! In all seriousness, you need this soup. This soup needs you. The universe is basically demanding that you both be together. Give in… and enjoy! I’ve made this soup before and absolutely love it. I was wondering if, when doubling the recipe, do all ingredients double the same across the board? Will a mixer work if I don’t have an imersion blender? Roasted the cauliflower and sweet potato beforehand and cooked on the stovetop. My daughter 8 complained about the cauliflower smell but loved the soup when she tasted it! I added a couple of leftover breakfast sausages to the pot. We are vegging out with a movie on the couch so crumbled potato chips on top! Wonder what a chopped apple would do for the flavours? Thank you for the recipe! Thanks Deb! Loved the addition of breakfast sausage and I think apple would be fun to play around with – maybe as a topping along with white cheddar and some bacon to balance out the sweet? LOL about the cauliflower – veggies like broccoli and cauliflower aren’t the best smelling while they cook but MAN are they delicious! Glad y’all are enjoying the soup! Tried this recipe a few months ago…OMG. It is hands down on my top 3 favorite soups list. SO good and so easy to make! I have to use a regular blender because I don’t have the immersion one but it comes out just fine! Highly recommend! Thank you so much for sharing this recipe. I’ve had it saved on FB to try for a while. Just broke down yesterday and made it. I did roast the cauliflower, garlic and onion prior to throwing it in the Crock-Pot. I also had to strain everything and mix in my food processor as I don’t have a stick mixer (?) that was an experience. But, when I bowled it up, my hubby was very mad he choose a sandwich over this delicious soup! I usually stick with loaded potato soup or something meaty (chicken stew, beef stew, etc). I loved this! And have told my hubby he has to buy an immersion blender for next time I make this. I made this the other night and we both thought it was delicious. I checked my vegetables at the 4.5 hour mark and they were done. I resisted the urge to use bacon as we are trying to stay vegetarian as much as possible. Made this today & I love it. I had to adjust the taste w some more of the seasonings. But it was great. I just added the crumbled bacon (Applegate-turkey bacon) to the soup. And then sharp sheddar & more green onions as toppings. Mmmm!! Yum!! We’re in the heat of Wisconsin summer now, but this will be even more welcome this fall & winter! Made this today. It was so easy. Decided to add a few stragglers from the vegetable bin. Carrots x4. At the end used almond milk and 4oz cream cheese (as mine didn’t seem very thick). Then just before serving added cup of sharp cheddar cheese. Topped with apple bacon and green onions. It was a hit with my husband along with Olive Ciabata. Sounds amazing Sandra, thank you! I made this on 2/7/18 to have on 2/8/18 (soups and stews are almost always better the next day). I followed the recipe exactly but used frozen cauliflower rice instead of fresh. This soup was delicious! It was thick and rich and had levels of flavor. I also roasted broccoli, Brussel sprouts and carrots and added them after the milk/cream cheese and when the cooking was done. I served it with shredded smoked cheddar cheese and bacon bits. My new favorite! Tina I’m in love with the extra veggies you added – such a tasty mix-in for the soup! Thank you! Could I use a bag (or two!) of frozen cauliflower for this? I have a couple in my freezer and this recipe sounds delicious! this soup is amazing!! it has definitely earned a spot in our regular rotation. I just made it for the super bowl festivities and my husband and all his meat-eating friends love it. I love cauliflower and sweet potatoes so much but I’d never thought to combine them! I chose to make it vegan as well. I used almond milk in place of dairy milk and for the cream cheese I substituted cashew cream (just cashews and a little water in a high speed blender). I also switched out half of the paprika for smoked paprika and left the skins on the potatoes for all those extra nutrients. I just can’t get enough of this flavor. so good!! 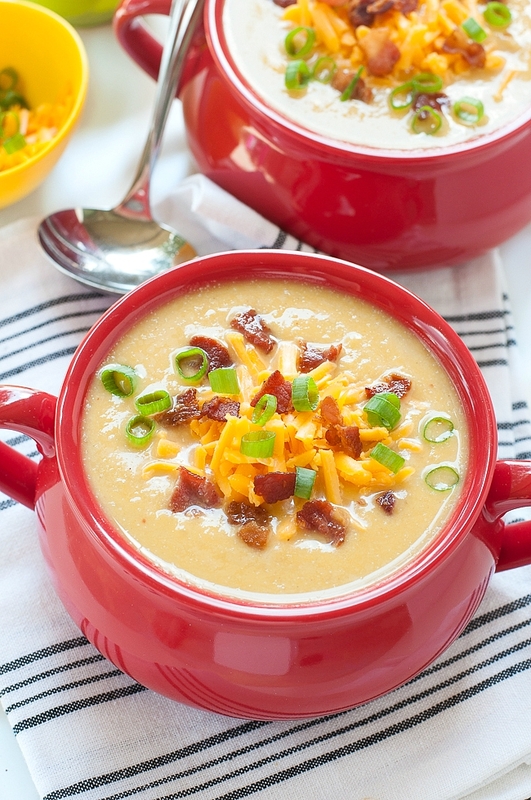 perfect for “souper” bowl sunday! I agree with Alex’s comment, copied below. I didn’t do anything wrong, followed the recipe. I love cauliflower and sweet potatoes but this was awful. Had to open the doors and windows to get the stink out of the house. We chose not to eat it. We are typically soup lovers but found this soup bland and not of a particularly appealing consistency. Just read through the comments to see if anyone tried it dairy free. Bringing a dish to a potluck & want to feed as many as possible. I can see coconut milk working well, but I do not do well with soy, so need to skip soy-cheese subs. Do you think it will really work without the cream cheese, please? Thanks! Hi Karen! 🙂 I’ve had a few people tell me they’ve made it dairy-free over the years and they’ve used coconut milk and just skipped the cream cheese entirely (you can add a little extra coconut milk to taste at the end if you think it needs more richness) – I’ve also made it with almond milk and liked it as well! Could you possibly use anything in place of cauliflower? i.e. more sweet potato or another veggie or starch? i dont have any and am trying to make this! Hi Daisy! Carrots work marvelously in place of the cauliflower and you could also try more sweet potato if you’d like! Depending on how much you add as your swap, adjust any seasoning and toppings to taste as needed and you’re good to go! This soup is so good. It sounded strange when I read ingredients but it is really good and hearty! Thank you! This sweet potatoe/cauliflower soup looks scrumptious, however with diabetics in my home, I need nutritional values. Any idea where I can get them? Maybe I did something wrong or just have really different tastes from the positive reviewers here but I really didn’t like this. I actually cooked it and then opted not to eat it for dinner.. that’s how much I disliked it. The flavours were all off and it really made my apartment stink! 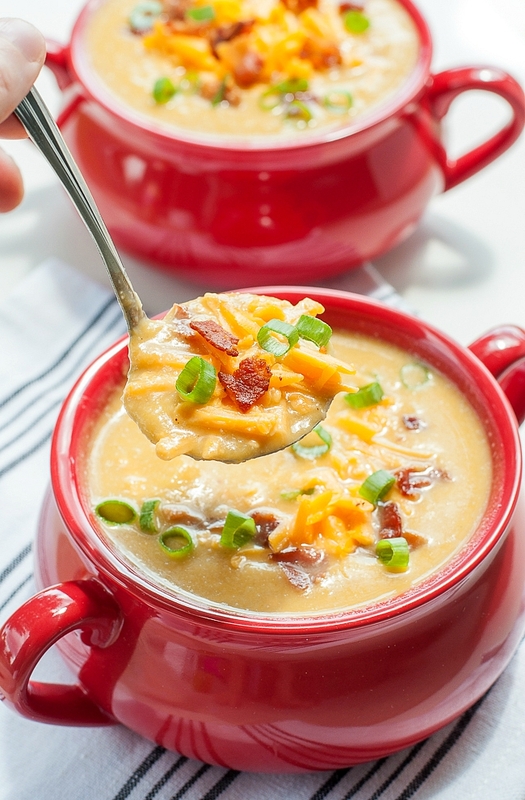 This Slow cooker Sweet potato and Cauliflower Soup sounds marvelous! Do you think I could you use leftover broth from cooking chickpeas as my vegetable broth? Ohhh MYYY God!!!!! Just made this tonight and it was incredible!!!! I love cauliflower soup anyway but the sweetness of the sweet potatoes coupled with the spiciness of the red pepper flakes put it over the top!!! I added some crumbled bacon and cheesy garlic crotons and thought I’d died and gone to Heaven!! Definitely a keeper soup recipe!!! This was a lovely soup. Didn’t have a definite vegetable flavour even though I thought the cauliflower would come through stronger. Whole family enjoyed it. Another wonderful soup to add to our favourites. Thanks for a nice recipe. Made this for dinner tonight and while I thought it was going to be really good, but no one in my family cared for it. Followed the recipe except for the thyme. Something just tasted off, I don’t know what it was maybe the paprika. Tasted too sweet with a weird cauliflower aftertaste. Worth a shot, but won’t make again. So sorry to hear that Marie! Sweet potato based soups (especially veggie-heavy ones) for sure have a light sweetness to them. I once made one with apples and it was total overkill – I couldn’t handle the sweet apple with the sweet spud, lol. I hope you’ll give another recipe a shot sometime, hugs! It’s in the slow cooker! Can’t wait to have the 1st bite! Better be good my mother in law is coming for supper!! Made this tonight and we are fans! Man! Super yummy, filling and pretty healthy too (used low sodium broth and low fat dairy). Thanks! So thrilled you enjoyed it Mary! 🙂 Thanks for the sweet review! I decided to make this soup today, but I accidentally added the milk and cream cheese with all the other ingredients in the beginning. Do you think it will come out ok? Thinking of making this soup. Sounds delicious. The receipe calls for 4 stalks of green onion is that suppose to be celery? Hi Maryann! I have an obsession with all things green onion in my recipes, it’s just so delightful! They’re often called scallions as well. They’re onion-y in flavor but on the milder side which I love! I tossed everything into the slow cooker..used around 1.5 pounds of each and that fit just fine in my 3.5 liter crock pot and imagine I could have totally used he full 2 pounds without any issues. I pureed it with the milk and cream cheese and served it with crumbled up bacon and shredded cheese. We absolutely loved it! Thank you so much for an affordable healthy recipe and that will be made often during the cold winter months that are upon us..Oh! I used smoked paprika instead of plain and it was really good! So excited to try this! Making it right now!! Quick question. When adding all the ingredients to get it started, should the broth cover everything? Wondering if I may have put too much cauliflower in because it is above broth? I’m about to make this a second time, because it is SO delicious! I mean, seriously, this is really great soup. It’s all stormy and rainy here today, and the weather brought this soup to mind – perfect comfort food (and those veggies!). I just made this & is delicious!!! I like the little bit of kick to it too!! I made this last night and while it is delish I would use chicken broth next time for a richer flavor. So I was wondering if it would be ok of I cooked this on low for about 8 -9 hours without being able to stir it??? Looking to make this while im at work and cone home to it done. I don’t own a slow cooker. Sounds like I could just cook this in a large pot on the stove until the veggies are tender? Do you think it will make much difference? You absolutely can, Megan! Maybe halve the recipe so it fits in a standard pot? I don’t think I own a pot as big as this recipe yields 🙂 I wish I did! I really wanted this soup to be delicious. It was easy and fun to make.. but.. It didn’t taste good. I followed the directions carefully and it was just to much Califlour taste. I like Califlour, but this combo just didn’t jive with my taste buds.. My husband and I forced ourselves to eat at least one bowl.. but we won’t make this again. I’m so sorry to hear that Dee Dee. It’s been a huge hit with family, friends, and readers but I know that not every recipe will suit everyone’s tastes. It still bums me out that it didn’t make the cut for y’all but I hope the next recipe you try rocks your world! Hope you’re having a great week! Another winner! I have a confession: I set you up to fail. I am totally not a cauliflower fan as evidenced by the fact we are in year 2 of the Veggie of the Year: Cauliflower. I’m trying and eating and trying . . still not loving it. So I had very low expectations for this soup. But I liked it the first night and LOVED it the second! We topped it with shredded cheddar and scallions first then cheddar and pepitas the next time because we wanted something crunchy. Amazing stuff! Thank you again for yet another great recipe! I made this for my parents and they loved it! Both of them HATE cauliflower and sweet potatoes and they got seconds! Thank you so much for helping me make something healthy and delicious for them! Thank you Rachel!!! I’m beyond thrilled that they loved the soup — hooray for embracing new veggies and loving it! 🙂 You’re such a good daughter! Divine! I used butternut squash, instead of sweet potatoes………..OH MY WORD! My 4 and 5 year old’s lapped it up–and I had three bowls! Would you please post the nutritional value of the recipes? I would like to make the cauliflower and sweet potato soup, but need the values for my husband and myself. Thank you. Quick question… do the garlic cloves go in whole (and then they get chopped up by the blender) or did you dice them first? This looks delicious, and a great way to incorporate some good veggies! Printed and I’ll be making this weekend! Thanks Cristina! I hope it’s a hit! I have a 4.5 quart slow cooker. Will it still do or should I cut the recipe in half or 3/4…? This looks so good. I really want to make it but I dont have an immersion blender? Any other options? Thanks Julie! Absolutely! Do you have a blender or food processor? You can blend the soup in batches using either one. Just be sure not to fill either up to the top since hot liquid expands a bit and could knock the top off your blender. That’s how I blended all my soups before I got an immersion bender [best Christmas gift ever! I’m obsessed!] and it works just as well at making your soup oh-so-creamy and smooth! Well it sounds marvelous and will put cauliflower on list in a.m….I have one question tho…to make it lower carb–im not against dairy and don’t seem to have an issue with it (on paleo) and was curious if anyone has made this with canned coconut milk–and if so would you skim the cream off the can after refrigerating first? Just wondering if anyone has experience with that substitution..thanks!! luv your site!! Thanks Jo! I tried it with almond milk! Christie from 3 Whole Peas in Our Gluten Free Pod made hers with soy milk and a few tweaks and it came out great too — I think you could try any type of coconut milk you love! Adding the full can with the cream would make the soup super luscious and if you like the taste of coconut you should be good to go! <3 Hope that helps! Ooh --- and it's marvelous with a little drizzle of Sriracha too! I made this tonight – so good. but I can’t say I followed the recipe. after I added the cauliflower to the slow cooker it became abundantly clear that my cooker was smaller that what the recipe called for. So I winged it. About equal portions of sweet potato and cauliflower, enough of white onion, 3 green onions, 3 cloves of garlic. Still about a quart of broth. then all the milk and cream cheese. By the time 5 hours had passed, I had forgotten I didn’t make the full recipe! 🙂 I really like it with uncured turkey bacon, green onion and cheddar as toppings. My husband liked it too. Thanks Jenn. I love your recipes. Ahhh thank you! I’m so glad you loved it! And that it’s proven versatile when adding ingredients on the fly — so many of my recipes come to be b/c I have ingredients to use up and just wing it! <3 Thanks so much for coming back to say hello! <3 I can't wait to hear about what else you try! Cauliflower is my here. In fact, I’ve been known to call it the Super Man of the Veggie World before. Made it. Loved it. Thank you! This looks DE-licious! I love cauliflower soup, so I can’t wait for a cool day to try this soup! Thanks Kalee! Sending Fall vibes your way! It’s been so stormy here that I keep souping it up! Oh man…. this looks DELICIOUS! Absolutely perfect for the first slow cooker recipe of the year! Aw thanks Trish! Break out that slow cooker! There’s absolutely a chance it will fit but will depend on how much sweet potato and cauliflower you’re working with [every time I buy them the size varies a bit] As long as the raw veg and broth all fit you’re good to go, but even if you have to save a few chunks of cauli and sweet potato from the pot you can roast them up for a different dish and simply truck along with the soup! Hope that helps! OMG this looks absolutely incredible, so thick and creamy! Especially with all that cheese 😀 And the fact that it’s made in a slow cooker is a major bonus! We’re getting there! Next up is the office! And painting… messy messy painting! 😉 Thanks Debbie! This soup looks amazing! Unfortunately recently discovered that I’m lactose intolerant–thoughts on making this diary free? I made it using coconut milk and one oz toffutti better than cream cheese (completely dairy free) and it was amazing! Yay! Thanks Liz! I’m so happy to hear it worked with dairy free swaps! So funny I was just looking at dairy-free cream cheese at the store today – I’ve got to try it! Yay! I was so excited about this recipe til I saw the milk in it. So glad to know coconut milk will work! Gonna try it very soon. Absolutely use coconut milk! I typically prefer almond milk and coconut milk to moo cow 🙂 Hope you love the soup! Yummy soup. I have to make it, I wonder what my children will say:) Pinning! I am so pinning this – I had no idea you could freeze a cream soup. Thanks!